Growing vegetables and other agricultural crops in greenhouses for personal use and for realization offers significant benefits. 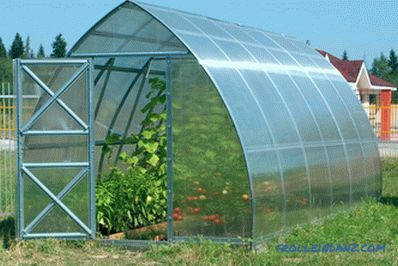 The best technical and operational characteristics show greenhouses with a metal frame, covered with sheets of cellular polycarbonate. There are many original designs of different shapes and sizes of industrial and own production. If you need a high-quality greenhouse, but you don’t know how to choose a polycarbonate greenhouse, then our detailed material will help you with this difficult task. 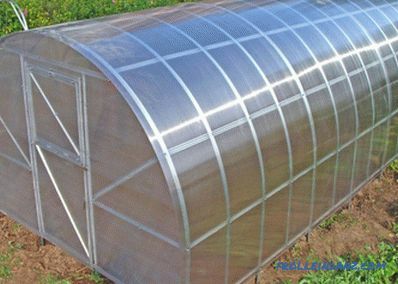 The classic greenhouse is an agricultural structure designed to provide reliable protection of plants from adverse environmental factors. Its basis is the bearing spatial framework of a certain shape. During the construction of greenhouses are governed by the requirements of GOST R 54257-2010, SNiP 2. 10. 04-85 and SP 107. 13330201. These regulations define the technical conditions and requirements for the design of greenhouses. 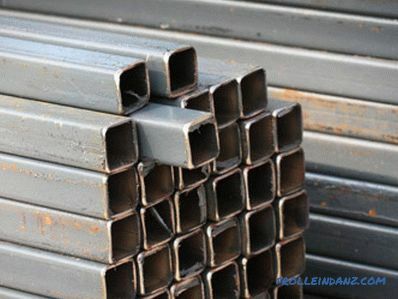 A galvanized thin-walled profile or a steel pipe of rectangular or square cross section is used to manufacture the supporting frame of this structure. Each of the above materials has its own advantages and features that must be considered when choosing it as the basis for a greenhouse. Galvanized steel profiles are lightweight and affordable. Moreover, its mechanical strength is clearly insufficient, which is compensated by the use of a larger number of elements. Connections between the individual parts of the frame need additional reinforcement. Often, such a framework consists of a variety of joints, and the thickness of the metal is only 0.5–0.8 mm, which is clearly not enough to withstand peak wind and snow loads. The supporting frame, welded from a steel pipe of rectangular section, is durable, highly resistant to constant and variable mechanical loads. The main disadvantage of it is the tendency to corrosion and the need to protect parts from rust. 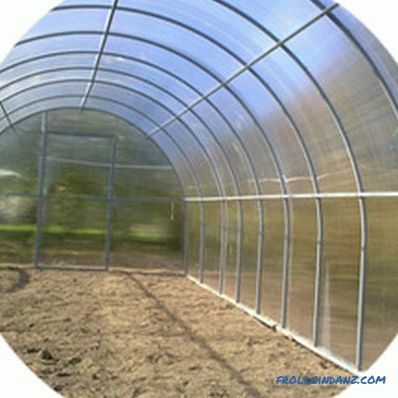 The frame of the greenhouse is quite difficult to manufacture, which determines the high cost. The arcs of such greenhouses consist of only a few elements, and may even be whole. The choice of material for the construction of the frame is carried out based on the requirements and capabilities of the customer. 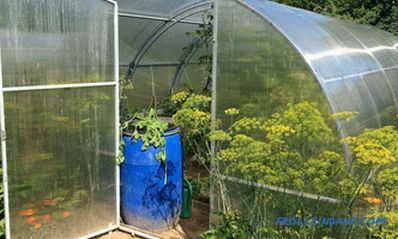 If you are going to purchase a finished greenhouse, then most likely you will be offered a frame on a thin-walled profile, less often there may be a frame from a profile of rectangular or square section. The best option for strength is the frame of the profiles of rectangular or square section. The thin-walled profile carcass will be less durable, but much cheaper and there is a high probability to run into low-quality manufacturers, which, in order to save, make the carcass not rigid enough. However, this does not mean at all that you should abandon this framework. 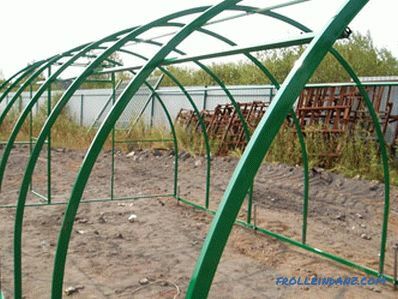 Just before purchasing such a greenhouse, you need to make sure that it is really durable, and the thickness of the metal is at least 1.2 mm. As a rule, each seller has samples of frames, you just need not be lazy to come and carefully consider the available options. 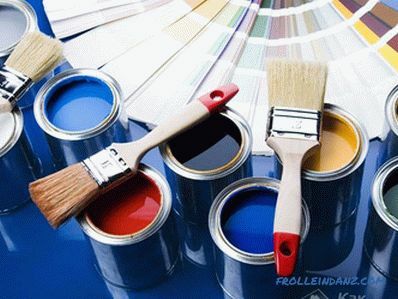 If the seller in every possible way hides and does not show samples of frames there is a high probability that you will be sold a low-quality product. How many elements consist of arcs, ideally so that they are solid-bent. 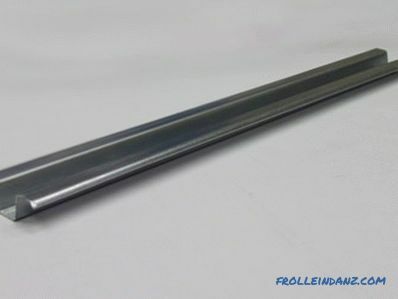 It is best if the frame profile has a rectangular section of 20 * 40 mm, this is especially true for the base of the greenhouse, because if it is made of a profile with a section of 20 * 20, this may not be enough. The thickness of the metal must be at least 1.2 mm. Otherwise there is a big risk that the greenhouse will not last long. Coating is of great importance for the performance of the greenhouse. 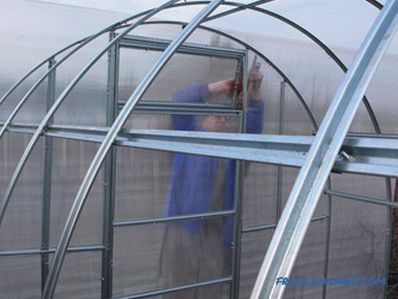 When choosing polycarbonate for the greenhouse, the following parameters should be considered: type of polycarbonate; the presence of a light stabilizing layer; material thickness. Today there are two types of polycarbonate on the market - honeycomb and monolithic Among these materials, honeycomb polycarbonate has the best characteristics for use as the roofing material of the greenhouse. Cellular polycarbonate is a sheet material from the group of thermoplastics, consisting of two or more layers with longitudinal internal bridges. This structure of the plate provides excellent technical characteristics and operational properties of the material. Quality Cellular polycarbonate has excellent light-transmitting characteristics of a selective nature. It almost completely absorbs ultraviolet radiation with a wavelength of 400 nm or less, the most dangerous for plants and the maximum transmitting visible and infrared rays. It helps to create a greenhouse effect. To protect cellular polycarbonate from the destructive effect of ultraviolet radiation on its outer surface, a layer of light stabilizing substance is applied by the coextrusion method. To find out about the presence of such a protective coating, refer to the appropriate inscriptions on the protective film glued onto the polycarbonate sheet. Here you need to be attentive. If there are no special marks on the protective film, this means that they are designed for indoor use. 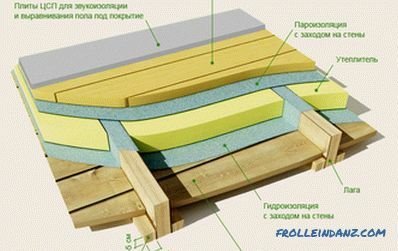 Attempting to use such materials for the manufacture of the greenhouse will lead to premature failure of the coating. One of the most important properties of polycarbonate is the ability to maintain its technical characteristics throughout the entire service life of the panels. Some manufacturers claim that UV protection is in the mass of material. In fact, it is not enough and it is intended only to prevent the destruction of the material during storage. When choosing a cellular polycarbonate for the construction of greenhouses, sheet thickness is of decisive importance. The specified parameter directly determines such properties of the panels as the light transmission coefficient, the level of thermal conductivity and the ability to withstand mechanical loads. For the construction of greenhouses are usually used sheets with a thickness of 4 to 10 mm, the most suitable for the main parameters. 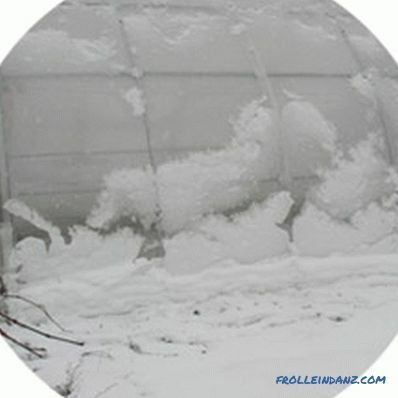 The sheet thickness is determined on the basis of the structural features of the frame; an increase in this parameter contributes to an increase in resistance to wind and snow loads. In some cases, different panels can be used on the same structure. 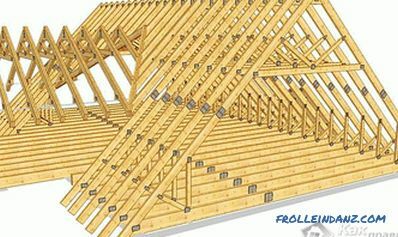 For flat and arched roofs sheets of greater thickness are used, and vertical walls are made of thinner panels. The most optimal is the use of cellular polycarbonate with a thickness of 4 - 6 mm. At the same time, it is necessary to make sure that the panel thickness declared by the manufacturer is actual. 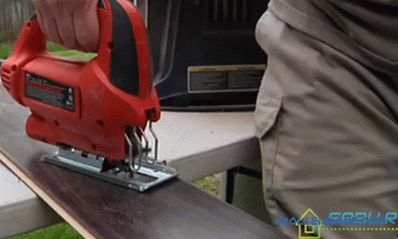 For this, the panel can be measured with a caliper. If the declared and actual thickness of the polycarbonate sheet do not match, the use of such material should be rejected. 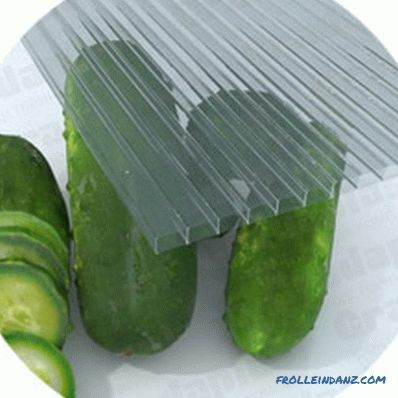 In no case do not agree to buy polycarbonate with a thickness of 3.5 - 3.7 mm. At the same time, sellers may say that this material has a higher density, so it can be used instead of 4 mm thick sheets. 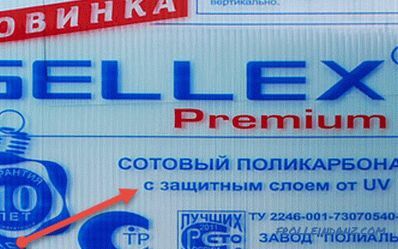 But most likely it is low quality polycarbonate, which has an extremely low life. 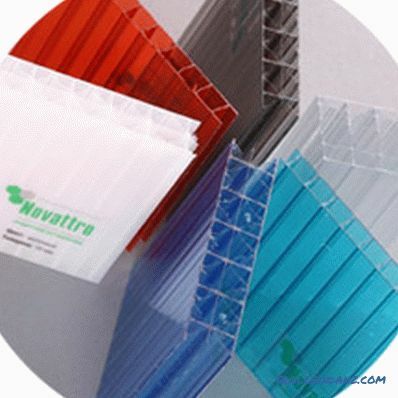 If polycarbonate bends easily from the impact of fingers and does not have a designation from which side the light stabilizing layer is located, then you have cheap material that has a service life of not more than 2 years. Compliance with the panel thickness stated by the manufacturer and indicated in the documentation and on the package. 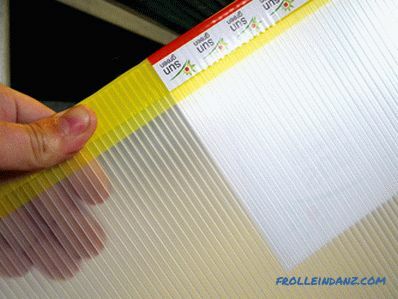 The presence of a safety film on both sides of the sheet, which protects them from premature wear. Availability of supporting documentation for the whole lot: certificates of conformity for products and passports. There are several types of agricultural structures of this kind. 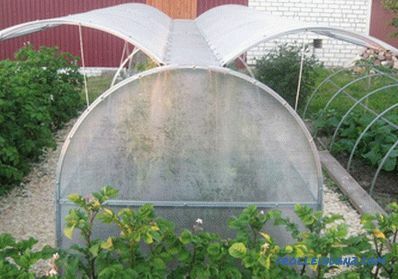 Arched greenhouse is a structure with a semicircular overlap. The spatial frame consists of arcs located at a certain distance from each other with transverse connecting elements. This type of greenhouses is most common among the population. The structure can be quite easily increased or reduced in length. This is done by adding or removing individual sections. This structure has rather modest dimensions and is rather a greenhouse, its main convenience is the possibility of lightweight access to the garden and the organization of ventilation of the internal space, if necessary. The connecting line consists of two curved surfaces, which form an acute-angled ridge. Such a device prevents the formation of snow cover on the slopes. An additional stiffener ultimately contributes to the strength of the structure. The simplest structure that uses enclosing structures of residential or office buildings on household plots as a supporting structure. During construction, a sufficiently large angle of the slope to the vertical is set, which prevents the formation of a stable snow cover on the surface. The building is located on the sunny side of the building to maximize the use of natural light. A gable classical greenhouse until plastic polycarbonate appeared was the only possible form. In appearance, it resembles an ordinary house with vertical walls and a flat roof. The simplicity of the design provides the possibility of its production without the use of equipment for arching arcs for the arched frame. Such a construction can be erected from any materials, including wood. When choosing the shape of a greenhouse, the owner is guided by several factors, primarily its purpose and its own financial capabilities. For growing seedlings, a small wall structure or a greenhouse with lifting walls will be enough. 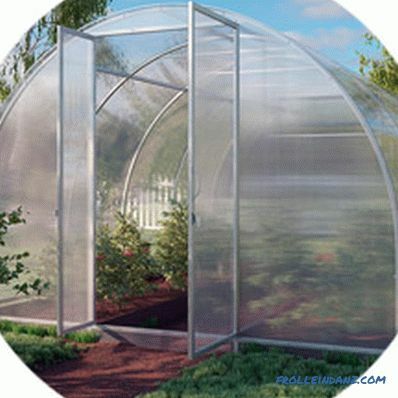 Vegetable production will require solid arched or gable greenhouses with associated costs. When determining the size of the greenhouse, its purpose and planned production volumes are primarily taken. Design work, even in the most simplified version, allows with sufficient accuracy to calculate the required amount of materials. It is necessary to establish the length, width and height of this structure. This takes into account the area and configuration of the site and the convenience of working in the greenhouse. The angle of the slope of the roof is determined, providing spontaneous sliding of snow. When determining the size of the doors, it should be noted that the person in the course of the work will carry tools and agricultural equipment. In addition to the entrance in the wall provides folding transom for ventilation structures. The frame device should be such that the joints between the individual sheets of polycarbonate should fall on its elements. This approach can significantly enhance the design. The overwhelming majority of greenhouses have a relatively light construction and significant windage, and can be turned over by the wind. 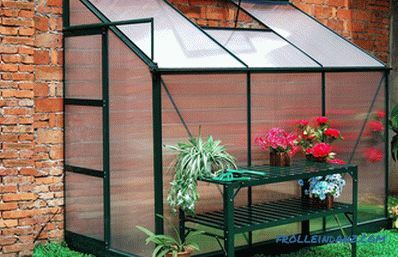 Polycarbonate greenhouses must be carefully fixed to the base, which may be in the form of a strip foundation with a brick or stone base. The device of such a supporting structure requires significant investments and is used only for fairly large stationary greenhouses. 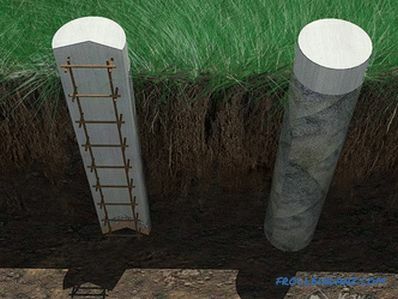 Fastening of the supporting frame to the foundation is carried out through the use of embedded elements. Structures made of steel pipes are usually welded to special metal parts embedded in the base. 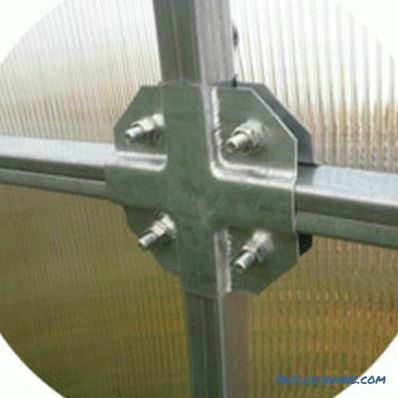 Frame made of galvanized profile are attached to the brickwork with dowel-nails or anchor bolts.The latter method of installation is more reliable. 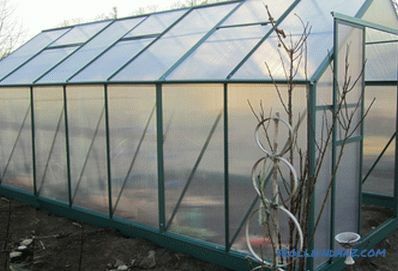 The question of choosing a greenhouse from polycarbonate is reduced mainly to determining its size and shape based on its purpose and the capabilities of the owner. High-quality construction must be properly installed on the site, which will ensure its long-term operation.